Please click here for the Penn Mini-Fellowship handout. Please click here for more education opportunities! The Department of Psychiatry University of Pennsylvania is approved by the American Psychological Association to sponsor continuing education for psychologists. The Department of Psychiatry University of Pennsylvania maintains responsibility for this program and its content. Participation in the BSM Mini-Fellowship carries 21 CE credits. 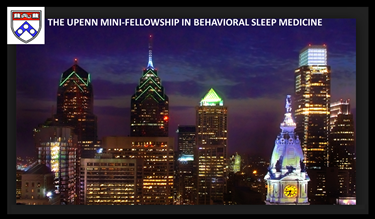 For clinicians interested in a broader exposure to Behavioral Sleep Medicine and Sleep Medicine in general, we offer a 3-day Mini-fellowship. This experience involves a small group didactic / seminar experience that covers a broad range of advanced topics and provides the opportunity for extensive QnA. This experience may be seen as the culmination of a sequence of experiences that begin with the CBT-I Principles and Practice Basic Course and the CBT-I Advanced Practice course. The Mini-fellowship may also be appropriate for more seasoned clinicians that already have some experience in CBT-I. The dates will be the 2nd Tuesday, Wednesday, and Thursday (Bi-monthly) starting in February 2018. Day 1 is with Michael Perlis (101 questions you have always wanted to ask + other advanced topics, e.g., alternative models of insomnia, PSG report interpretation, EEG classification of sleep, sleep meds, etc). Phil Gehrman PhD (signs & symptoms of intrinsic sleep DXs, assessment, & actigraphy). Jackie Kloss PhD (Women's Health and Sleep; Sleep in Adolescence. Day 3 is with Jim Findley PhD (review of recorded sessions and advanced practice issues). Guest faculty may include: Donn Posner PhD, Erin Vera PhD, and Nalaka Gooneratne MD. Special requests for other Penn faculty are encouraged and every effort will be made to accommodate such requests. The cost is $1699 + $25 for APA CEs per person. Because we are not affiliated with a hotel or external hosting agency, attendees are responsible for securing their own accommodations. Please note that there are a limited number of hotels in West Philadelphia, so please make reservations early. If you are not able to stay in West Philadelphia, Center City (the neighborhood opposite the Schuylkill River) offers a plethora of hotels and is a short (10-15min) walk/subway/taxi ride away!